So we are contemplating homeschooling the boys. We haven't made any final decisions, except that we are going to do preschool at home. I have been having fun with it, and it is so rewarding to watch the boys learn and enjoy our "preschool" time. Sometimes we just call it our "activity" time. And recently I have found some nice printables at this site. Olivia usually hangs out on a blanket or bouncy chair next to us, or we do preschool while she's asleep. We usually do their preschool activities on the days we stay home and don't go anywhere. I really love having something ready for them to work on, since I was running out of activities for us to do together. With the added bonus that they are learning fine motor schools and letter/numbers/shapes,etc. We also try to go to story time at the library at least once a week, (Love story time!) and check out books for us to read throughout the week. Our other favorite (educational) destinations are the zoo and the museum. We have a season pass to the children's museum, and we are going to see their new Curious George exhibit later this week! Well she turned 3 months about 6 weeks ago, but I am catching up on my blog posts! Alan has gone to the Las Vegas Star Trek Convention for the past 3 years, so Olivia and I joined him for the weekend. Olivia was such a good travel buddy! We took my mom too, for babysitting while we went to a few shows and restaurants. My mom, Olivia and I traveled by ourselves on the way there, since Alan went early. 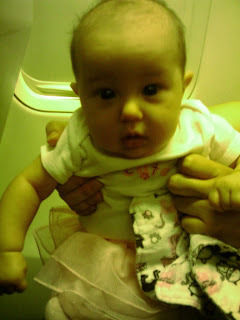 Olivia's first plane ride. She did awesome! We cloth diapered her the entire time, and just changed her diaper right there in the chair. There really was no place to change her in the airplane lavatory. In the beach pool at our hotel. Did I mention the boys were not invited? At my favorite buffet ever. ...And going in for a forehead lick (yuck). Sometimes they have too much love! They always want to be touching her. She has continued to be a very laid back baby. We have been battling some baby acne with her, but I finally realized she was spitting up after I laid her down to sleep, and getting some spit up on her cheek. After I started staying up and changing the blanket under her about 5-10 minutes after she fell asleep (it always had spit up), the rash started to clear up (finally!) I was going through about 5 or 6 blankets a night. She is a very "spitty" girl! She only wakes up 1-2 times a night, and hardly cries except when she's tired or hungry. Her brothers absolutely adore her! The same Pumpkin Patch last year. I let the boys pick out two pumpkins each, and they played in the hay and roamed through the pumpkins. They didn't want to leave, so I told them, "When we get home, we can make a pumpkin pie for Daddy!" Adam: "Let's hatch the pumpkin!" Me: "What do you think is inside a pumpkin??" Adam (without hesitation,) "A bird!!" They helped me make the entire pie from scratch. And we roasted the seeds and ate those. It was a fun activity. Matthew using Olivia as a pillow. "I'm 'sleeping' on Olivia, because... I love her." That broke my little Mommy heart, and Alan has always said I didn't have to work, even before we had kids. But I wanted to work. After we got pregnant I thought I would work two days a week, but decided on once a week after we found out it was twins. Then I ended up being canceled a lot when the boys were babies, and only working 1-2 days a month, which was doable (but still hard.. pumping enough milk for twins.) They developed close bonds with their grandparents who watched them, and it was a much needed break for me. As they got older I found I really didn't need that break anymore, even though I still enjoyed my job. I was enjoying being a Mom more since I didn't have two colicky babies anymore. Even on the hard days, I really felt like I was where I needed to be. I struggled with what to do while I was on maternity leave with Olivia. I made up my mind, then changed it, so many times!! The problem was I loved my job, I loved the little NICU babies, I loved my coworkers and I liked the money. But I felt like I had abandoned by three little ones, and I was starting to have an empty feeling when I went to work. Like I wasn't where I belonged. I feel that I can go always go back in the future, if that's what we decide is best for the family. But for now, (even though I will miss my coworkers and the babies) I am so glad I don't have to leave my kiddos for 12 hour shifts anymore!! Last day of work for a while.